“All we want to do [as an organization] is help folks in our community,” said Aden Batar, immigration and refugee resettlement director at Catholic Community Services, located at 745 E. 300 South in Salt Lake City. The primary goals of CCS are to help those in need and create hope for people who have none. According to its pledge, “Catholic Community Services of Utah has been empowering people in need to reach self-sufficiency.” CCS does this by lifting up those in the community, regardless of gender, race or religion. In 1945, the Rev. Duane G. Hunt of the Catholic Diocese of Salt Lake City saw there were many people in need of assistance. These folks were poor and no help was coming their way. So, with that, Hunt started an organization to contribute to his community. According to the CCS website, this organization started by creating adoption centers, poverty assistance, foster care, counseling and transit programs. Following 1945, Hunt’s organization continued to expand, beyond his death in 1960. It grew from a single office to four different sites and buildings that deliver social services to folks in need of help in Utah, specifically Northern Utah and the Wasatch Front. As the organization grew it strove to help more and more people in need of assistance. The Rev. Hunt’s organization joined the United Way Agency in 1951, allowing them to help more people, according to the CCS website. That is why it is important for community organizations to continue their work by maintaining the places like the soup kitchen and increasing their reach. Poverty and hunger continue to be an issue in Utah. According to the U.S. Census, more than 10 percent of the population is living below the poverty line. That is one in every 10 people living in Utah. Add to that, Utah is ranked fourth in the United States for the highest rate of very low food security. Not only has Hunt’s organization made efforts to help the hungry and homeless in our community but they also strive to help others in need like immigrant and refugees, says Batar. The Rev. Terence M. Moore added the refugee resettlement program to Hunt’s organization in 1974. The refugee foster care program was established the next year to assist unaccompanied minor refugees. Shortly after the organization began assisting with refugees it added immigration services in 1981. Included in those services was aid to the disabled and the Utah Immigration Project. Both immigrants and refugees are facing a new environment but they are coming from vastly different situations. Immigrants are choosing to resettle in a new location whereas refugees are being forced to leave their homes and find a new one, according to cnn.com. Although they don’t all come from the same situations they need some of the same assistance. Stamos said CCS will continue to contribute to the needs of others by helping those weakest become strong and functioning members of the community. “Hopefully, in the future we will be able to help more people, knocking down the number of people in need,” Stamos said. That may be a harder challenge for the CCS refugee services compared to the organizations other programs. The problems come from political controversies and new policies centered on refugees. With threats of policy change and residents angry about potential safety concerns, the number of refugees getting help may be reduced. Drake wanted to reassure the staff, volunteers and those who receive assistance from CCS, that the organization will continue to help refugees transition into a new country, culture and lifestyle. Of course, any organization is only as good as their volunteers, Stamos said. Without volunteers CCS would never be able to reach its full potential. So, if you want to get involved with some volunteer work, the website lists multiple opportunities. One can volunteer to assist refugees, or monetary donations are always welcome. With all the challenges facing people today, it’s nice for people to know a resource like Catholic Community services is available to assist them. The creation of social media has connected people worldwide. For some, it’s a tool used to help refugees of war-torn countries. Through various organizations, a person can simply click a link that redirects them to a donation site where they can send money to provide relief to refugees struggling to survive financially, medically and educationally. But, knowing where the money is going is crucial. Humanwire is a website geared toward assisting refugee families. It claims 100 percent of donations go to the cause. It was founded by Andrew Baron in Boulder, Colorado, in November 2015. It has marketed itself by encouraging its followers to share personal stories of their supported refugee families and donation campaigns via social media. Just like most businesses, Humanwire understands that word of mouth from those you trust bridges the gap between hesitation and execution when it comes to buying a product — or in this case, donating money. Humanwire allows donors to choose a refugee family to support by way of social media-like profiles on its website. The amount that is donated, whether all at once or collectively, allows donors greater or lesser degrees of interaction with the family. Individuals providing smaller donations are awarded limited information about the family they have sponsored, whereas larger donations allow you to interact with them via live-stream on Skype. Jackson says she hasn’t donated or posted about it for months. However, she receives email notifications that friends and strangers alike continue to donate to her chosen family as a result of her old social media posts. She’s received single donations to her Humanwire account totaling $1,000 to support her refugee family. Some are from people she doesn’t even know. Trusting that their friends and loved ones are vetting the organization, it has left little thought for many to follow through with the research portion of the company before handing over their hard-earned dollars. In the summer of 2017 it was claimed in a YouTube video, posted by Humanwire’s co-founder Andrew Baron, that the director of its “Tent to Home” program, Anna Segur, had stolen $10,000 via ATM withdrawals. The other co-founder of Humanwire, Mona Ayoub, was living in Lebanon, taking care of the company’s donations, schools, students, teachers, employees, and registering refugees. In August 2017 after the funds stopped, Ayoub said via Facebook Messenger, she flew to the United States to get to the bottom of the issue. Unfortunately, she discovered Baron had mismanaged the funds and misrepresented the way they were being used. She said Baron claimed the money had gone toward operating costs even though Humanwire had promised all donated funds would go to the refugees. In September 2017, Baron later admitted to the Denver Post to have taken as much as $80,000 over the last two years. However, after a police investigation, it was discovered that Baron had taken over $100,000 from Humanwire and was arrested on felony charges of charity fraud and theft. Ayoub submitted her letter of resignation on November 1, 2017. “Had I known the extent of mismanagement and misrepresentation prior to traveling to the United States, I would have resigned immediately,” Ayoub said. Yet more problems have surfaced since the claims against Humanwire. The organization has started to lose its partnerships with other organizations dedicated to helping refugees. “Standing With Alana” is a group whose mission is bringing awareness and aid to the Yezidi people from Syria who are facing a genocide at the hands of ISIS. Yezidi Emergency Support team leader Anne Norona was one of Humanwire’s contacts overseas. As Baron tried to extinguish the flames of ridicule on Humanwire’s Facebook page, Norona added more fuel by expressing her frustrations in a reply to Baron’s YouTube video, which he later shared on Humanwire’s Faceboook page. With allegations publicized, both internally and from its partners, it has left donors wondering what happened with the money intended to help their refugee families. Through Humanwire, donors like Cooper have their own financial account to hold money for their refugee family. Whenever the family needs certain items they can use that money to purchase them on Humanwire’s site and have it delivered by local representatives. At least, that’s how it’s supposed to work? However, she says she’s noticed over the last few months things haven’t quite been the same. Cooper has had approximately $1,000 left of the $3,000 she raised in her family’s account, but she has been unable to use it. Cooper even went as far as commenting on Humanwire’s Facebook page asking for answers, but says her post was deleted by the company. When trying to get in touch with her point of contact, she was made aware that person had left the organization. Cooper’s love for her refugee family, with whom she has kept in contact, is what has fueled her to investigate the dealings of her funds. After all, at the end of the day it’s the refugees, not the donors, who suffer the biggest loss. “The organization did do a lot of good in the beginning,” says Laurel Sandberg-Armstrong, a donor of Humanwire. “My guess is they expanded too fast and lost control,” She said in a phone interview. The Federal Trade Commission encourages anyone who is thinking about donating to a charity to do research beforehand. Well-known organizations such as the United Nations High Commissioner of Refugees (UNHCR) and the International Rescue Committee (IRC) are generally good options for those wanting to donate. Humanwire was contacted for comment. An employee replied via Facebook Messenger saying the accusations were misunderstood and they still encourage people to support their organization. What makes a home? Is it the people you live with, or is it the pictures and decorations within the house? Is it the home-cooked meals, or the fun and games with family and friends? No matter what it is, a home can be defined in many ways. However, leaving the place you call home often is only described in one way: difficult. Gerald Brown, the Utah state refugee coordinator and assistant director of the Refugee Services Office, has dedicated his life to helping refugees. On a daily basis, Brown works side-by-side with the International Rescue Committee (IRC) developing programs designed to make the resettlement process less traumatic. One of these programs that the IRC has established is called Adjustment Support Groups. Jennica Henderson, the mental health program coordinator for the IRC in Utah, said in a phone interview that the curriculum of these groups consists of three parts: adjusting to the U.S. and a new culture; mental health; stress management and community wellness and development. Following the curriculum, refugees participate in an eight-week course featuring a new topic weekly that falls under one of the three key concepts of the curriculum. These topics in order are: introduction to the group and establishing guidelines and rules; culture shock and moving from one country to another; refugee experience; mental health and tools to overcome stress; mind and body connection; goals and dreams. Adjustment Group at the Central Park Community Garden. Photo courtesy of New Roots SLC. In Utah, these groups are just getting underway, as they have only been in use since fall 2016. They are funded by grants and currently run in the spring, summer and fall and are only offered to women. However, the program is expanding to start its first male group in spring 2018. For now, the program meets at the Central Park Community Garden, located at 2825 S. 200 East in Salt Lake City. The signup process for the group is simple: there is none. When a refugee is resettled, their location is saved within a database. Henderson said one of the goals of the program is to make the ability to attend as easy as possible. Therefore, once a location for the group is chosen, based on their geographical location, refugees are then called and invited to attend. When invited, refugees are asked what day and time would work best for their schedules. Based on the results, a day and time is chosen that is best suited for the majority. Refugees are also informed in that call that the IRC provides transportation to and from the meetings, food and childcare for who attend. In Utah, up to three separate support groups are offered at once. These groups are led by three instructors — Jennica Henderson, Alex Haas and Sara Franke — all of whom are employees of the IRC and have completed hands-on training to know the curriculum and know how to best help the refugees in their process of settling in a new culture. As refugees come and participate in the program, they meet new people and develop new relationships. Although the programs may never replace everything that a refugee lost, they are succeeding in what they were meant to do: helping resettle in a new home. War. Persecution. Death. Three things that many people in other countries across the world have to face on a daily basis. They go through life living in their homeland in fear. They’re left with two options: Stay in the country and risk death, or flee for survival. Many choose to stay, but many choose to become refugees. According to a letter to Gov. Gary Herbert included in the Utah Refugee Services Office 2016 report, 1,200 refugees have been resettled in Utah annually by the CCS and International Rescue Committee. The refugees who are resettled in Utah can choose from different programs to help them adapt to a new culture. One option is the New Roots Program, organized and managed by the IRC. The program consists of three parts: Community Gardening, Micro-Training Farm Program and the Sunnyvale Farmers Market. This program is designed to help the emotional well-being of the refugees as they try to adjust to a new country, culture and way of life. In this program, plots of land (approximately 14 feet by 20 feet for 100 total square feet) are reserved for local refugees and their families throughout the Salt Lake community to grow crops from their home country and to come together as a community. Alex Haas, community garden program coordinator, said it is their opportunity to not only work, but also to provide for their family while connecting with others who may come from the same circumstance. There are 15 different gardens throughout the valley that refugees have access to. Also within this program, Haas said, is the opportunity to meet as a group to develop skills and become accustomed to the new society they are in. Within these adjustment groups refugees can discuss their feelings, learn skills such as how to deal with anger, stress, depression and ultimately become self-sustained as they build a new home. “The purpose of our community gardening program and adjustment groups is to help refugees become self-sustaining moving forward,” Haas said. The next step in the New Roots program is the farming aspect. After resettled refugees have participated in the community gardens for a year, they have an opportunity to work on larger plots of lands at the Redwood Road Micro-Training Farm, located at 3060 S. Lester St. in West Valley City, to continue their farming. Jordan Bryant, manager of the IRC’s New Roots program, said in a phone interview that the farm is maintained by generous grants and donations. The farmers pay different amounts for seeds and plants from their heritage, and tools to grow them to bring their home to Utah. Currently, Bryant said, there are about 33 farmers who are there on a constant basis. These farmers, each of whom were once strangers, develop a community with one another as they work together to grow and sell their crops at local farmer’s market. Although it is not the main source of income for their families, the refugees rely on the farming as a source of income for their families. At the same time, they continue to develop relationships and friendships with the other refugees around them. The Sunnyvale Farmers Market, located at 4013 S. 700 West in Salt Lake City, gives the refugee farmers the opportunity to provide for their family by taking the food they grow and selling it. It is also an opportunity to bring food from cultures around the world to the refugee community. Escaping persecution is a long journey. But after choosing to leave their home to survive, the New Roots program has given refugees the opportuntiy to bring a piece of their culture to Utah. Protesters rally in the Maidan. Photo courtesy of Art Ira via Facebook. The winter of 2013-14 changed the lives of Ukrainians forever. Thousands were displaced and forced to find shelter in either refugee camps located in more peaceful areas of Ukraine or across the border in Russia. This happened when former Ukrainian President Yanukovych decided to back out of joining the European Union (EU), which would have allowed better trade with European countries and a step toward westernization. Instead, Yanukovych rejoined with Russia. In the bitter cold, citizens took to the streets to protest the decision and demand the impeachment of their president. Thousands of protesters filled the town square in Kiev, also known as the Maidan. Not even the Berkut (riot police) could force them out. A civil war erupted between the Berkut and protesters. It was then that President Yanukovych fled to Russia and gave the Russian military permission to take control of the situation. As bombs shook some homes and demolished others, thousands of Ukrainians fled, only taking what they could fit inside the suitcases they would be carting around for months, potentially years. According to the United Nations, there are over 2 million Ukrainians displaced and another 300,000 seeking asylum in neighboring countries. Aden Batar, immigration and refugee resettlement director for Catholic Community Services, says that refugee camps are crowded and some of the tents may be filled to capacity, forcing people to make their own shelter using other resources. Batar says one can receive refugee status for various reasons, but in the case of Alex Evgeniya — it was his political affiliation. “We are refugees from Ukraine, but our status is still pending,” Alexey Evgeniya says. Evgeniya and his wife are from Crimea, a peninsula that was part of Ukraine until Russia invaded in February 2014. Russia then decided to annex the peninsula making it its own. “Me and my wife had to escape and almost got killed since we never supported Russia,” he says. Along with their escape comes anonymity. They, as well as many other Ukrainian refugees, are reluctant to divulge information in fear of Russian intelligence intercepting any and all channels of communication, thus putting their own lives in danger. Ukraine is no stranger to conflict. Ukraine fought for Germany in World War I. In World War II Ukrainians were divided. Some fought for Germany, others Russia and many for their own independence. As a country pinned between the influences of the Soviet Union and Eastern Europe, it seems they’ve battled a constant game of tug-of-war being pulled in all different directions. It wasn’t until 1991 that Ukraine declared its independence from the USSR. However, in 1994 Ukraine signed an agreement to be protected by the Russian military. Thus, allowing Russia to once again grab hold. Kernytsky says most refugees he associates with tend to focus more on life since their resettlement and choose to leave the past where they believe it belongs — in the past. One of Kernytsky’s congregation members was a professional bobsledder who trained for the Nagano, Japan, Winter Olympics. Though she was the superior athlete, another candidate bribed the officials and made the team instead. She was discouraged but decided to continue training for the Salt Lake City Winter Olympics. This time she made the team. It was unclear as to what the “bribe” entailed. However, it would be one of the major factors as to why she didn’t dare go back to Ukraine following the 2002 Olympics after making and competing in the bobsledding event she was denied four years prior. Seeking asylum, she stayed in Utah and graduated from the University of Utah with a Ph.D. in physical therapy. She is now married with children and works as a physical therapist in Salt Lake City. Class at the University of Utah. It’s likely tough to imagine something good on the horizon when you are engulfed in such hostile and tense situations. But tragedy often helps one to understand and appreciate the most important things. Aden Batar helps us to recognize most of those things aren’t necessarily tangible. Those looking for unique Asian or African handwork and artisanship in Utah need not look much farther. These homemade treasures and more are now available for sale through a nonprofit organization for artisan refugees recently organized in Salt Lake City, Pathways to Self-Sufficiency. At the launching of the Global Artisans project of this organization on March 30, 2010, at the Salt Lake City Main Library, tables were lined up in a conference room displaying true cultural riches. Handcrafted jewelry, knitted clothing for young and old, homemade cards and other objects were portrayed and sold by artisans. Not only are these crafts practical, but they also show the potential of self-sufficiency of refugees. 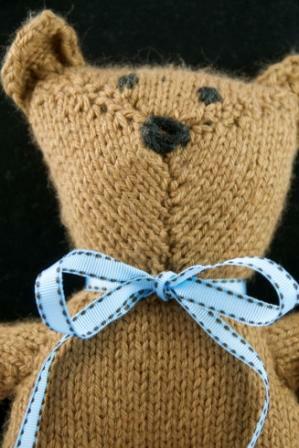 As women and men craft these gifts for sale they are actively pursuing the chance to provide for themselves. At the same time they learn vital business skills. The artisans from many different countries presented and sold their work to attendees. Although not all of them spoke English fluently, they were all eager to use the language skills they did have to sell their merchandise. Some of them even worked on their various projects at the event, creating traditional woven baskets from Africa and knitted baby socks. As refugees, they can put their skills to work and offer local shoppers diverse and unique selections. The best part about this nonprofit program is that the artisans are able to make some profit without extensive business education and marketing skills. 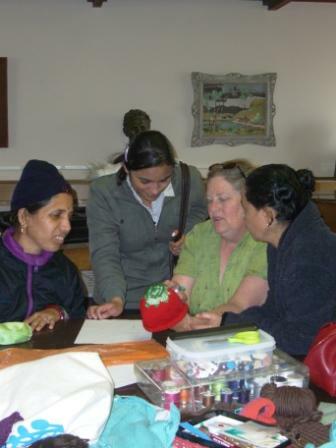 Pathways and its volunteers support the artisans in the promotion of merchandise. 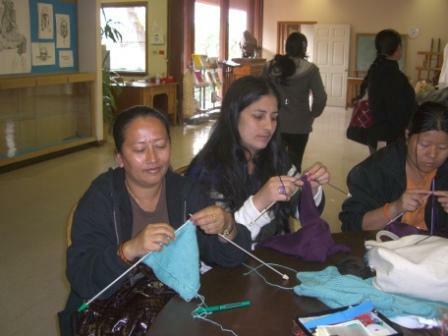 In a step-by-step process the artisans learn the craft, like sewing or knitting, with supervised assistance from volunteers, then they prepare it for sale on the Global Artisans‘s online store. Once a week, men and women who want to make an extra income meet for a few hours of training. At the Pioneer Craft House they receive supervision by experts in the respective fields, and together they learn, talk and laugh. Many times the artisans bring in knitting work they’ve completed at home for a last check, or they ask questions about how to improve their craft. This program also offers free entrepreneurial training at Salt Lake City Community College by a group of volunteers. 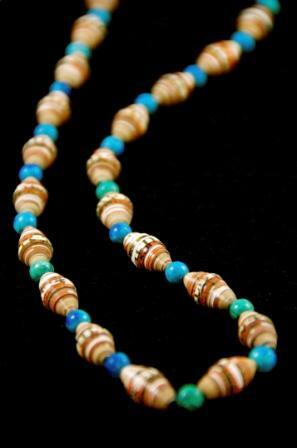 The Global Artisans project can only accept a limited number of people at one time. Through these business courses, training by specialists and on-the-job help, the artisans are placed in the best position to know how a business works for the future. Missy Larsen, a volunteer coordinator for Pathways, said the project helps to close the gap between other organizations and services. While there are various groups to support refugees, this specific opportunity not only helps them immediately, but also gives them long-lasting business knowledge and skills they can apply to supporting themselves later on. Larsen said she first got involved in helping refugees when she supervised a service project for youth. But it turned into something she couldn’t walk away from. “There are so many needs a refugee family has, from finding a job to needing to drive to appointments,” Larsen said. This program directly helps them to succeed and make some money to live on. Ze Min Xiao, refugee services liaison for Salt Lake County, is a volunteer and one of the driving forces behind Pathways. She advocates helping refugees in Salt Lake City to become self-reliant, which she said is a great step forward. With the support from American Express in providing a grant for the market goods, the artisans can take home their profit, with only 10 percent of the proceeds going to cover overhead costs. Xiao explained how getting a job and being able to successfully integrate into the community is especially challenging for refugees. Learning to live in a new country can create emotional stress and people often encounter financial difficulties if they cannot find work because of language barriers. Laxmi Timsina, 23, makes necklaces and bracelets. She’s also trying her hand at sewing artwork on pillowcases. 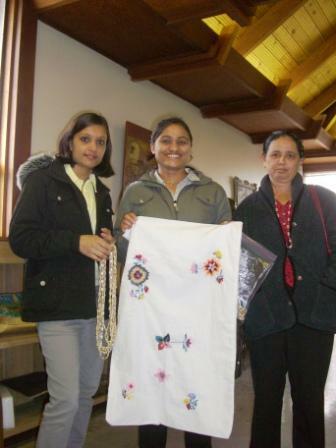 She has been involved with Global Artisans since she arrived from a refugee camp in Nepal in 2009. She was practically raised in a refugee camp, she said, after her family left Bhutan because they were Hindu under a Moslem ruler. Although she already learned to speak English in the camps, she said it’s particularly difficult to find a job as a refugee. This is especially unsettling when working against a deadline. “The government helps us for six months, but after that we are on our own,” she said. Although money is tight, she hopes that other family members can join her here in Utah soon. Her friend Nirmala Kattel, 22, is also involved with making jewelry for Global Artisans. A Bhutanese herself, she said her family was forced to go against their religious beliefs when the King had Hindus persecuted. They then stayed in Nepalese refugee camps, where she spent most of her life. Kattel said it was a challenge to acclimate to life in Utah, especially in the first months. She lives with her husband and in-laws, and she is still getting used to the greasy and sweet American food.